Take a look at the winners of the School Tournament Series event here in Niagara Falls! Christopher Hu, Mackenzie Deng, and Dakota Thomiaes from the University of Waterloo beat the competition this weekend to win some awesome prizes for themselves and $1,000 for their school. Congratulations to Christopher, Mackenzie, Dakota, and the University of Waterloo! Here are the winners of our Yu-Gi-Oh! School Tournament Series event here at YCS Secaucus! Congratulations to our School Tournament Winners! YCS Denver School Tournament Series Event! Congratulations to the winners of the Yu-Gi-Oh! School Tournament Series event here at YCS Denver! Here are the winners of the Yu-Gi-Oh! School Tournament Series! 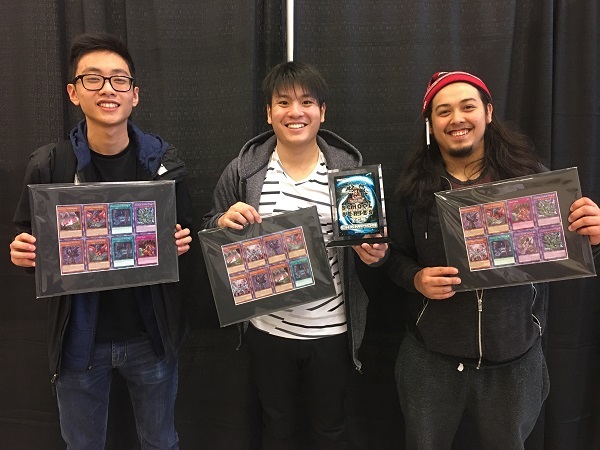 YCS Minneapolis School Tournament Series Winners! Six teams of three Duelists battled it out today, representing their schools in the School Tournament Series! You can learn more about the Yu-Gi-Oh! TRADING CARD GAME School Tournament Series by clicking here. Three school teams emerged victorious above the rest, each earning a ton of awesome prizes. Just for participating in the event, everyone receives an exclusive Yu-Gi-Oh! journal, but these three teams are walking away with quite a bit more. The Yu-Gi-Oh! TRADING CARD GAME School Tournament Series! This weekend, YCS Providence will host the inaugural tournament for the Yu-Gi-Oh! TRADING CARD GAME School Tournament Series!